iDream.tv Proud to support first responders in this multi-jurisdictional emergency preparedness drill, expertly coordinated by Jonathan Bundt of Masa Consulting and Thomas Miller of City of Minneapolis. Find out what happens when two bikers collide and a dirty bomb explodes on the shores of the Mississippi River. The exercise included over 220 participants from local, state, and federal agencies. Our talented team of videographers were embedded in this fast paced, day-long drill, collecting over 12 hours of footage, combined together to tell the story in this short video produced to document the event and meet federal funding requirements. 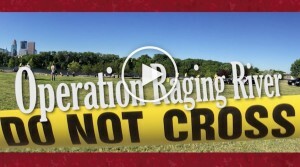 Operation Raging River: Emergency Preparedness Training from iDream.tv.